And so we come to the third and final installment of The Hobbit – The Battle of the Five Armies, which wraps up this humble little story well. In the context of the first two Hobbit movies I was not disappointed. It’s always wonderful to sit back and experience a few hours in Peter Jackson’s Middle Earth. Any excuse will do. The Battle of the Five Armies picks up exactly where The Desolation of Smaug (part 2) ended: Smaug flying off to smite Laketown. And boy does Smaug smite poor old Laketown. His fire-breathing ferocity is completely terrifying and the people are fleeing and the town is burning… And then Bard manages to slay the dragon. It’s all very spectacular. They could have finished the second movie with this as the climax — and considering it was called The Desolation of Smaug, I have to wonder why they didn’t. But it certainly makes for a fabulous opening to this one. The rest of the movie deals with the build-up and playing out of a mighty battle between dwarves, men, elves, orcs and monsters that takes place outside the gates of Erebor, the dwarven halls under the lonely mountain. Apparently both the massive pile of treasure and strategic position of the mountain are coveted by just about everyone. Thorin (Richard Armitage) is one of the major driving forces of this movie, as he spirals into madness and paranoia as the result of ‘dragon sickness’, obsessed with retrieving the Arkenstone. He barricades his small party inside the mountain, irrationally refusing to treat with the survivors of Laketown or King Thranduil and his elves, who have arrived seeking to reclaim certain elven artifacts. But he eventually comes to his senses and I loved his final battle scenes against the pale orc, when he redeems his honour. Martin Freeman is once again brilliant as Bilbo: honorable, brave, stubborn, resolute. He stands up to Thorin when the other dwarves won’t disobey their king, and although he doesn’t get to do too much in the battle, his actions leading up to it are significant. Thranduil, the eleven king (and Legolas’s father), is a fairly major character in this movie, and I love the portrayal by Lee Pace. He’s again the perfect blend of arrogance, capriciousness with a measure of benevolence — and boy can he fight! He spins around, robes and hair flying, to great effect. Blood-spattered or no, he’s pretty hot. Legolas is, of course, also once again a highlight. He doesn’t say a great deal, but he gets to do a lot of fighting with both arrows and swords, not to mention leaping around in mid-air and performing all manner of cool stunts. Gandalf starts the movie imprisoned in the black fortress by the ring wraiths (similar to his imprisonment on Orthanc); but is rescued by Galadriel, accompanied by Elrond and Saruman. Here they come face to face with Sauron’s Great Eye for the first time and Galadriel does her scary dark queen impersonation and beats him back… I’m not sure how much of this is in the book, but I felt it was a bit overdone… overly dramatic — particularly given the level of ignorance about Sauron at the beginning of LOTR. Gandalf knows about Bilbo’s ring at the end of this movie… why doesn’t he even consider the possibility it’s the One Ring? Huh? I couldn’t really get that excited by the storyline focusing on Bard and his three teenage children. Luke Evans is quite pleasing to look at, but somehow I didn’t feel that invested. The human survivors of Laketown spend much of the movie holed up in Dale, the ruined city outside Erebor that was abandoned when Smaug came to the mountain. They have to fight a lot of orcs. In fact, a lack of depth in characterisation across the board remains my biggest complaint with the whole series of Hobbit movies. I think the writers could have done a lot more with most of the characters (including the various dwarves). Considering we’ve had two or three movies to get to know them, they remain, for the most part, fairly two-dimensional. LOTR managed to make you care much more for its much larger cast of characters. They all have much greater depth of character and emotion. The Hobbit pretty much fails on this score in my view — it’s beautifully visual, with rousing action, but doesn’t have nearly as much heart. It makes me realise how utterly brilliant the LOTR trilogy is, though. As a final note, it was lovely to hear Billy Boyd (Pippin in LOTR) singing the song for the end credits of Battle of the Five Armies. All three of The Hobbit movies have real folky end-credit songs… it occurs to me to wonder whether they’ve used some of the original songs from The Hobbit, because after An Unexpected Journey none of the dwarven songs are featured in the movies. I must look into that. Also, as with Return of the King, the end credits feature ‘sketches’ of all the main characters. Love that. On the whole, I enjoyed Battle of the Five Armies rather a lot, for what it is. I did of course adjust my expectations after the first two, but even so I don’t think it has as much padding (unless you count many many battle scenes of different shapes and sizes). The Hobbit trilogy may not leave the same lasting impression as the three LOTR movies, or inspire the same number of viewings, but it’s still a wonderful fantasy adventure that I will no doubt cherish and re-watch periodically for many years to come. 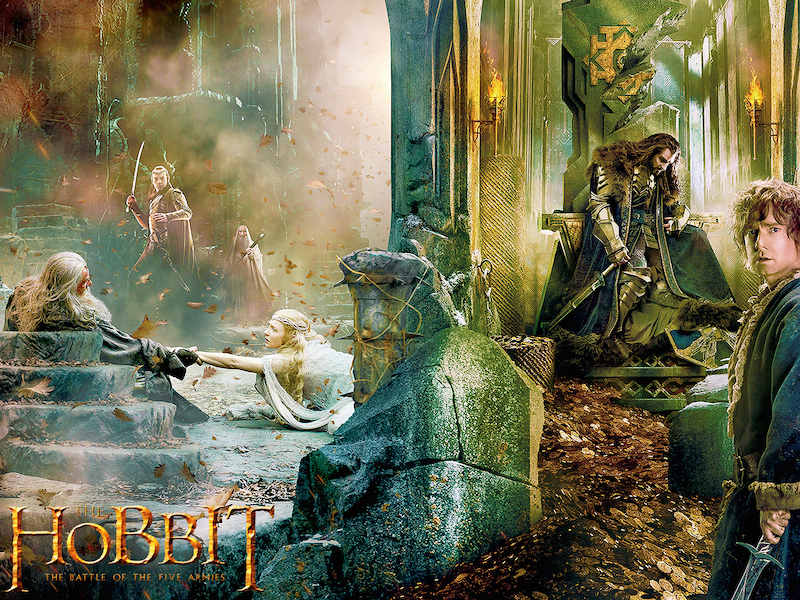 Here are links to my thoughts on An Unexpected Journey and The Desolation of Smaug. A weekend of hobbit watching sounds delightful. They’re a visual feast (Legolas! Kili!) and they’re fantasy. What’s not to like? I’ve only seen the first movie, but I thought it was okay. I got the Extended Editions of 1 and 2 on blu-ray for Christmas. I plan to watch them both before school starts back up, and maybe even catch the third one while it’s still in the theater. I don’t expect to like them as much as the original films, but they sound like they’re still fun. I’m a little shocked to hear there are extended editions… Now I’ll have to track them down, although in my view the whole thing is too long to start with. I LOVE the extended versions of LOTR, though. I think I would love the Hobbit trilogy of films without reservation if LOTR hadn’t come before. They’re great movies, but they just suffer by comparison with the brilliance that is LOTR. Re: Orlando Bloom — I gather they digitally de-aged him so he would look younger instead of ten years older. (He may not have been the only one, either…not sure.) Can’t explain the difference in character, though. Also, it has been pointed out that at this time, Aragorn would have been ten years old, so Thranduil’s hints about him to Legolas at the end make no sense! I hadn’t heard about a single-feature-length film. Are they really making one? It would be very interesting to see a Bilbo-focused version of the films. Through his eyes, so to speak. But I’m not convinced they could do it justice without shooting all the scenes with that mind. But, yes, I agree that all the important/memorable scenes in the book – especially those you cite – are the highlights in the movies. I cannot actually remember anything from the part of the book featured in Battle of the Five Armies. Not one thing. Aragorn is from the line of the Numenor, who are long lived, up to 200 years ish I think. I also believe that he quotes his age in the two towers as 87, which makes him roughly 30 ish at the time of the hobbit? Certainly still young by elvish standards, but old enough to be making a name for himself as a ranger. Actually i checked dates and i think Siri is right and he was 10 during events in The Hobbit. According to one source anyhow… However the dates with Bilbo dont entirely add up. He’s supposed to be 50 in The Hobbit and 111 in the LOTR. Which is a difference of 61 years, which put Aragorn in his mid 20s. Hmmm ??? I enjoyed this, Ellen, and I agree that this is a really enjoyable trilogy even if not up there with LOTR. I think over time it will become more appreciated. I liked that there was a good amount of Thranduil in this one — Lee Pace does a great job with that “You dare say this to MEEE?” look of his. Yes, lots of Thranduil was awesome. I think I appreciate the Hobbit movies more with every viewing.